With the inauguration of the 9.15-km-long Dhola-Sadiya bridge over the Brahmaputra river, the prime minister will kick start the celebrations of the NDA government's three years in office from this eastern-most part of Assam. The bridge is seen as an attempt by India to shore up its defence requirements along the Sino-Indian border particularly in the Northeast besides providing easy access to the people of Arunachal Pradesh and Assam with air and rail connectivity. It is 3.55 km longer than the Bandra-Worli sea link in Mumbai, making it the longest bridge in India. The construction of the bridge began in 2011 at a project cost of Rs 950 crore. The design is such that the bridge can withstand the movement of military tanks. "Assam and Arunachal Pradesh have huge strategic value to the country. Since the bridge is located close to our border with China, it will help quick movement of military troops and artillery in times of conflict," Sonowal said. The bridge is located 540-km away from Assam capital Dispur and 300 km away from Arunachal Pradesh capital Itanagar. The aerial distance to the Chinese border is less than 100 km. 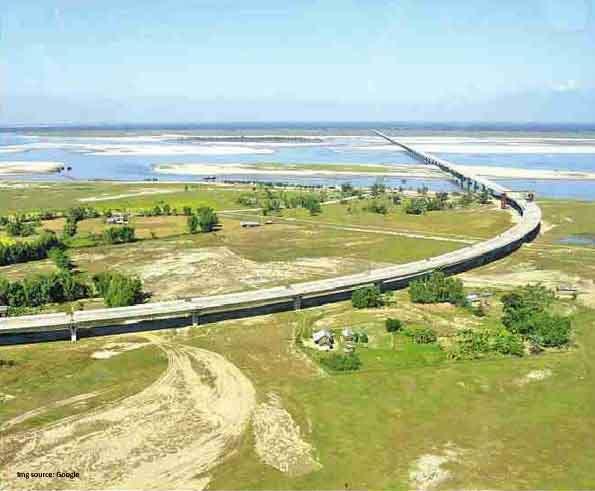 After Kaliabhomora bridge near Tezpur, there is no bridge over the Brahmaputra for the next 375 km upstream till Dhola, where the new bridge is constructed. Currently, all the transport between the two banks of the river are being carried out through water only. The bridge, when opened for the public, will cut down the travel time between Assam and Arunachal Pradesh by as much as four hours. As there is no civilian airport in Arunachal Pradesh, this bridge will help people of the state to reach the nearest rail head in Tinsukia and the airport in Dibrugarh easily. Sonowal said the delayed works of the bridge was expedited after Modi assumed the charge in 2014. The bridge was originally scheduled to open in 2015. The BJP government in Assam will complete one year in office on May 24. The bridge is one of the key projects of the Ministry of Road Transport and Highways in the Northeast and is built in public-private partnership with a construction company. সাহিত্য অকাদেমি বঁটাৰ সন্মান লাঘৱ কৰিছে কোনে?